Home / Aardman / animation / CP / DH / LAIKA / Podcast / stop-motion / YG / The AFA Podcast: Episode 53- Happy Birthday Aardman! The AFA Podcast: Episode 53- Happy Birthday Aardman! 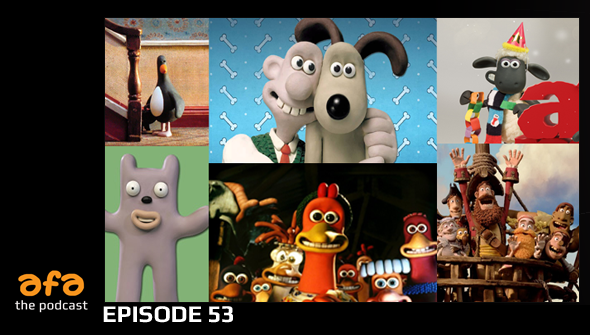 This month sees the fortieth anniversary of the UK's amazing Aardman Animation.. so we decided it was about time we celebrated them on the podcast. This week Chris, Dan and Yvonne are joined by independent animator (and former Aardman employee) Dani Abram to talk about the stop-motion supremos. In our news segment (0:03) this week we talk about a new documentary on internet animation, the upcoming animated Doctor Who episodes and the Funimation and Crunchyroll deal. Our What We've Watched segment this week is dedicated to a (spoiler free) chat about LAIKA's amazing Kubo And The Two Strings (0:28). Then we get on to talk about Aardman- (0:57) including hearing all about Dani's experiences working there! Special Guest: Dani Abram @bintykins Visit daniabram.co.uk to see all of her work! If you would like to help us produce even more great content, and get exclusive bonus content, please consider supporting us on Patreon!